My friends were busy giving me advice on our group chat because they are more bothered with my singlehood than I am. She swears it’s effective because she uses that line herself. Hmm… Yeah I don’t think so. 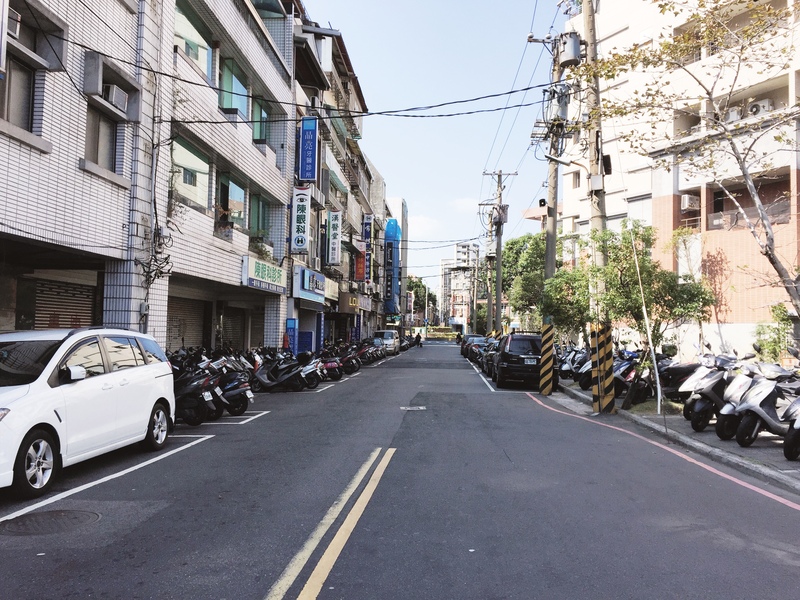 I was the only girl in the mixed-dorm in the hostel where I was staying in Taipei; and I didn’t know what to feel about it. I heard my room mates, white men of different nations, speaking in their own language. I heard Dutch, German, English, and I remained in the confines of my bed on the upper bunk pretending I wasn’t there. 1) Was I able to talk to anyone in that dorm? 2) Did I find anyone cute? 3) Would I recommend this hostel to you my dear readers? Please read on to find out. 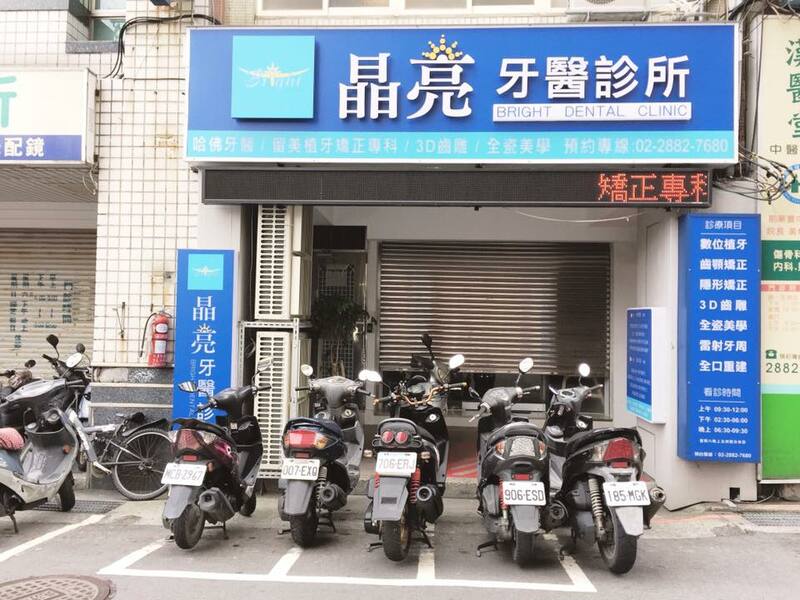 A few months prior to my Taiwan trip I booked a hostel near Taipei Main Station via Agoda. The boyfriend of my friend learned about it and recommended that I cancel my booking and stay at Happy Taipei Hostel instead. 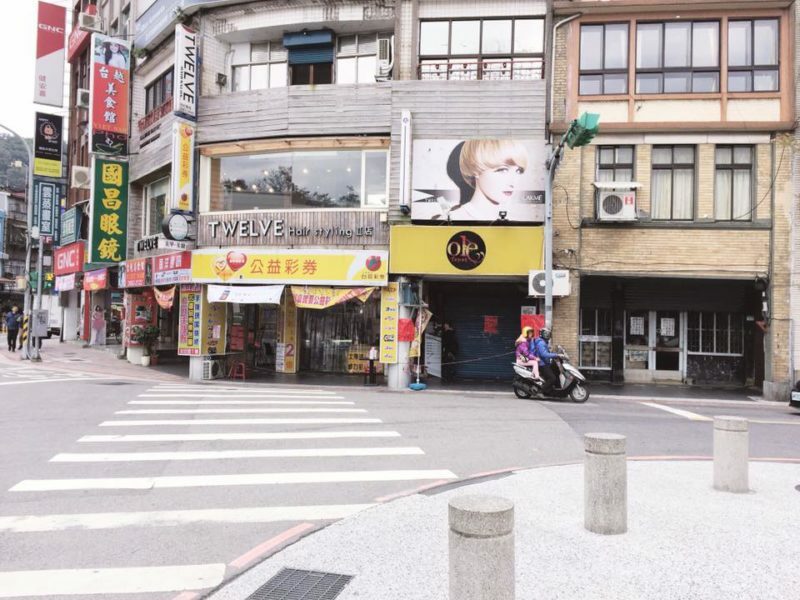 This one is in Shilin District and he said that it’s close to the most famous market in Taipei, Shilin Night Market. To be honest, I didn’t want to give up my previous booking, but I relented when he said that it’s cheaper at Happy Taipei. He booked it for me at Hostel World then forwarded the booking information to me through email. Happy Taipei’s email provided full information on hostel conditions and a comprehensive instruction on how to reach their place. They are so thorough you’d expect that I wouldn’t get lost—I did. Somehow, despite having a map I still lost my way. 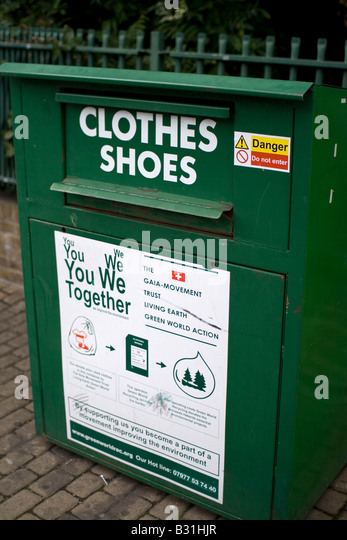 Then I saw a woman who just got off from her scooter and started stuffing old clothes in a recycle bin. I decided to approach her to ask for direction. I haven’t even finished a sentence when she waved me off. I just said ok and contemplated about how stupid I am. She seemed to have taken pity because she changed her mind and decided to help me. I showed her the map that Happy Taipei emailed me; moments later she was already driving me in her scooter to get to OK Mart, a convenience store. I would have wanted to ask her to deliver me to the hostel but Happy Taipei’s instruction stated that guests should give them a call so that one of their staff can come and fetch them from OK Mart. So that’s what I did. I thanked the kind woman for the ride then approached a payphone to make a call. 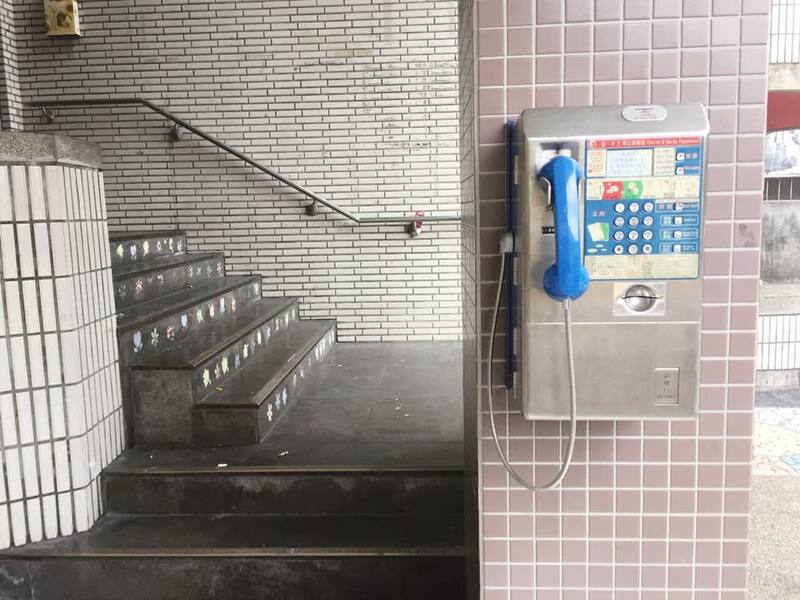 I don’t remember the last time I called using a payphone, it’s practically outdated in my country where everybody relies on their mobiles phones. But in Taipei, they still have them in every corner of the street. On the fifth ring, a woman picked up my call. I told her my name, location, then we hung up after she confirmed that she would be coming to get me. I went inside the store to get a pork bun (which by the way was really good) and ate it as I sat on the wooden bench outside waiting for the woman. 30 minutes later, a woman named Tina came to greet me. She led the way to the hostel, which is only a few minutes away from OK Mart. I realized that the hostel is not that hard to find after all. So before I make a review, I am going to show you first how to go there. Do not worry, this is going to be an adventure. 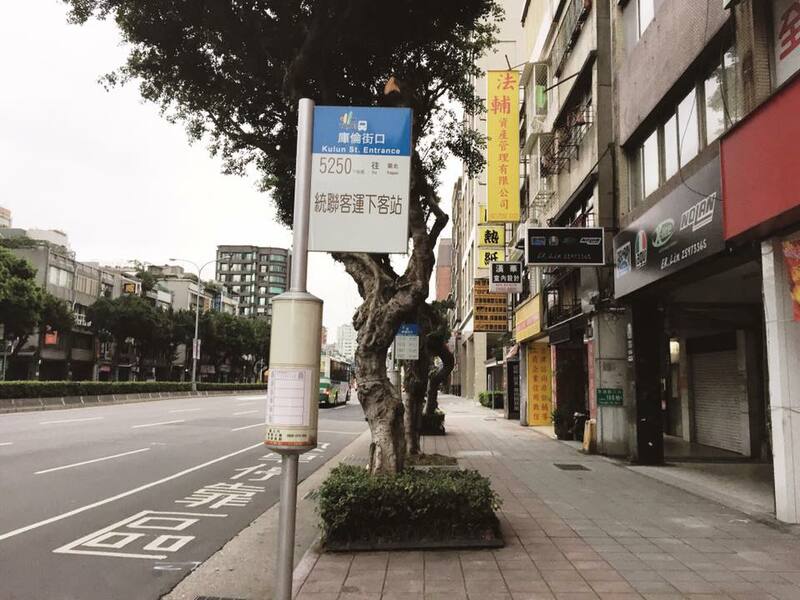 The first step is to get yourself to Shilin District, but first you have to go to Yuanshan Station where you can take the train. 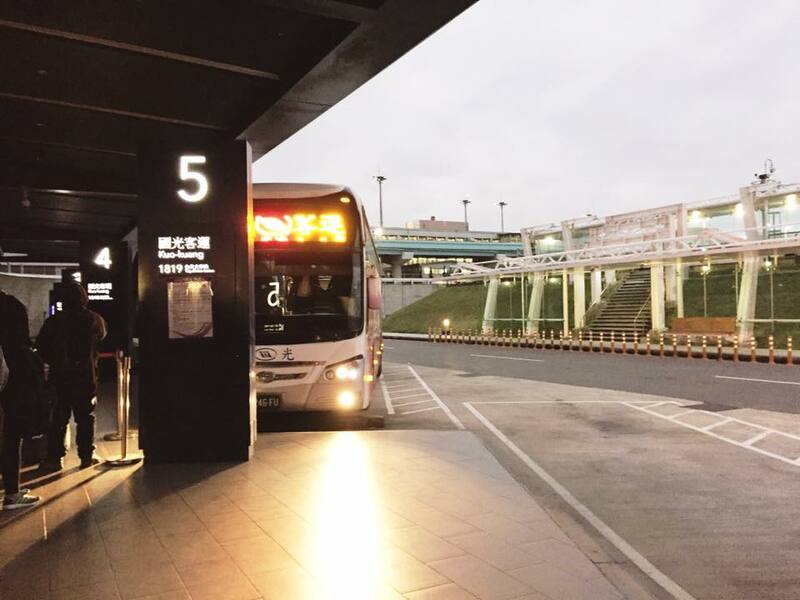 From Taoyuan Airport, purchase your bus ticket for 125 Taiwan Dollar (PHP 198.69 – USD 3.99) at the Arrival Passenger Reception Areas (it’s in the basement). Get the one for Kuokuang Bus, route 1819. Now take the bus and keep your eyes on the digital sign inside that shows the destinations. Travel time takes about 45 minutes to an hour. When you see Kulun, alight from the bus. See that picture above, well go the other way , I just took that picture to show what Kulun street looks like. Now you have to cross the road, then take this street in the picture below, walk straight ahead. Yuanshan train station is at the end of this street. 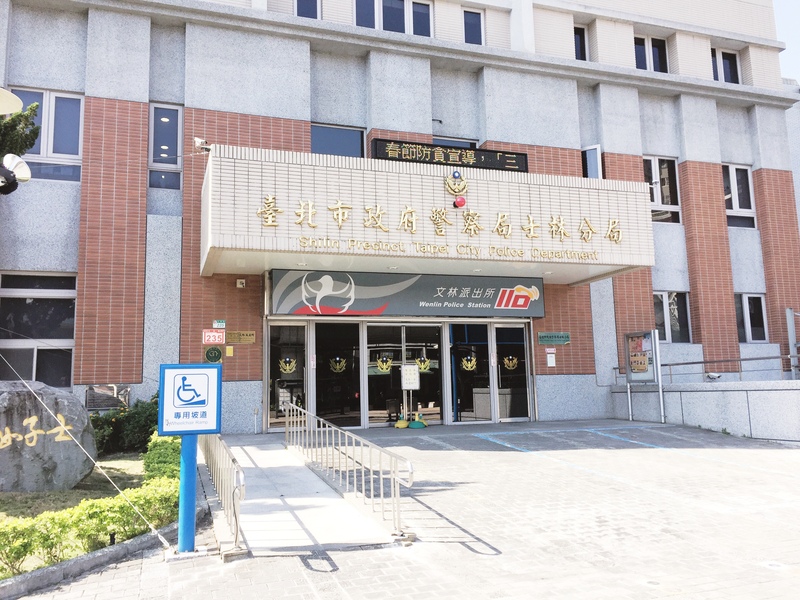 Enter Yuanshan Station then buy a ticket to Shilin, or, and this one I highly recommend for convenience, get yourself an Easy Card and load it up. This card is very useful because it’s accepted on the train, bus, even UBikes. From Yuanshan Station go to the lane that goes to Shilin; look up, check the red sign, and go where the Tamsui line is. Shilin is only two stations away from Yuanshan and travel time takes about 15 minutes. You can definitely do what I did; go to OK Mart, and have someone from Happy Taipei come fetch you. Or, you can be your own boss and follow this direction that I made instead . First, here’s the map. 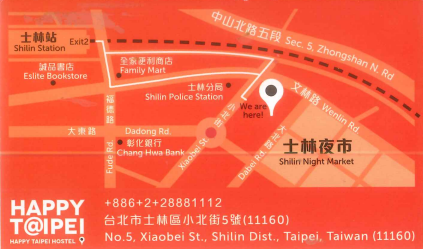 When you reach Shilin Station take the Shilin Night Market Exit. Cross the zebra crossing towards where the Ubikes are parked. Turn right, walk down the street, past Family Mart, and on the first block, turn left to Wenlin Road. Again, cross the street and walk ahead. 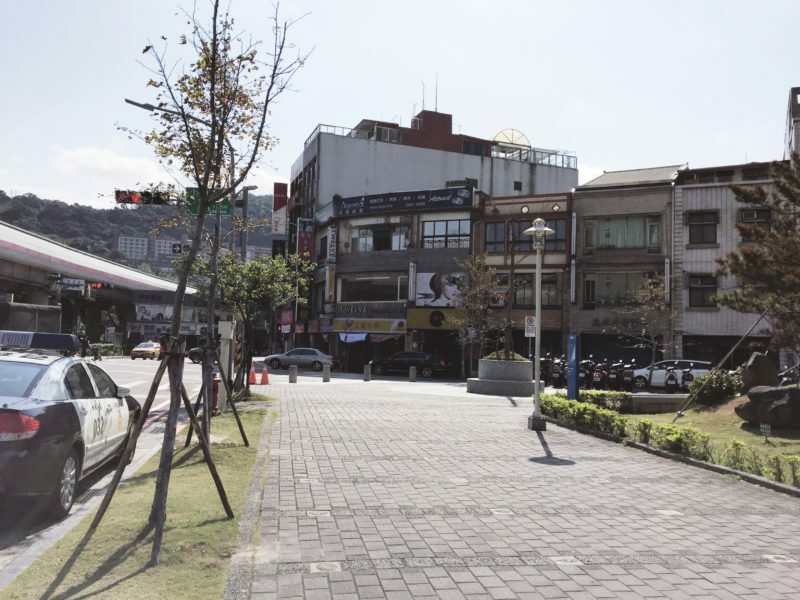 The most prominent landmark that is close to the hostel is Shilin Precinct, as shown in the picture below. Past the precinct you will see these. That’s when you’ll know that you are near the hostel. From here turn right and you will find Xiaobei street. Yay! You are quite close! Happy Taipei is on the left side of the street, can you see the blue sign? Let’s have a closer look at that blue sign, there you go! 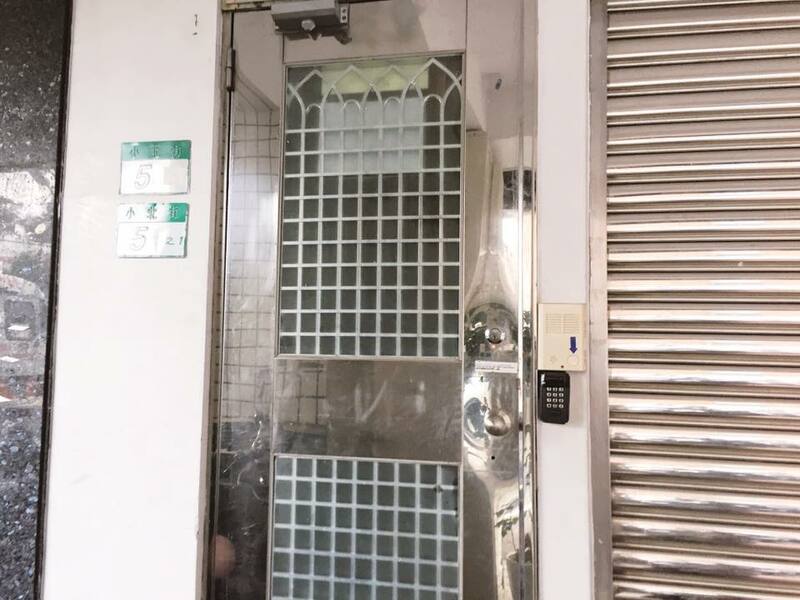 Remember that Bright Dental Clinic because the door behind it is the way that leads up to Happy Taipei. Okay here’s the door, I like to make it easy for you . Now let’s get down to business and review the hostel. Check-in time is after 2:00 p.m. and check-out time is before 12:00 noon. The first thing you should know if you want to stay here is to bring your own towel. Shampoo and soap are available in the bathroom and there’s hot shower so don’t worry about freezing to death if you go during the winter season (December-February). I went this January (just last week actually) so I experienced my first ever legit winter albeit without snow. Anyway, the toilets have no bidet (apparently, the Taiwanese are not fond of super toilets unlike the Japanese). They have private rooms and dorm beds. I stayed in a mixed-dorm and paid TWD 1,160.01 (PHP 1,843.84 – USD 37.01) for 3 nights. Inside the room there are security lockers and hooks to hang your clothes with. The room was already full when I got in save for one bed and it’s on the upper bunk. I would have wanted to be on the lower bunk because climbing up and down that bed was such a hassle, but yeah, all the other beds were taken already so I had no choice. There’s a curtain for some bid of privacy, an electric outlet, and a reading light. They use a spring bed and a duvet. That duvet is everything! It made sleeping extra comfortable and the nights, less cold. There’s a common area where guests can hang out, laundry area, meeting rooms, game room, and a kitchen with fridge, toasters, and microwave oven. Happy Taipei also offers free breakfast, which is my favorite part of staying in this hostel (that and the hot showers). They do have free WiFi but it was intermittent so I would recommend that you book a WiFi router with Klook instead. I am going to give you more information about it next time. What else should you know… Ah, they don’t have curfew, they will give you a set of keys; one for the room and another one for the hostel’s door. If you want to rent a locker, you have to deposit TWD 100 (PHP 158.93 – USD 3.19), which they will return to you when you check out. Also, they have a strict no smoking policy. Tina even mentioned this to me several times that I had to wonder if I looked like a smoker. I did talk to someone in the mixed dorm though it was nothing romantic. He came from the US and he said that Taiwan is his first country overseas. I did tell him about the Philippines (even advised him not to skip Manila to get a better feel of the life and culture). This answers question number 1. For question #2, there are other men in the hostel but I didn’t find anyone to my liking. And lastly, would I recommend Happy Taipei? Yes, but only if you don’t mind traveling and if you are looking for a more laid-back atmosphere. I told my friend that I was shocked to find that Shilin is too far from the central part of Taipei. Shilin District is 4 stations away from Taipei Main Station, but the train is fast and efficient so I didn’t really mind the travel. Also the bed was nice and the neighborhood is charming and quiet so I’d still give this hostel a rating of a 3 out of a 5. Hi Peach, sorry for the late reply as I had been away for a trip. I hope you managed to find what you were looking for in my blog. Everything Taiwan related can be found under Travel > Taiwan tab. Breakfast and hot showers are two things I look forwrd to whenever I stay in any accommodation. Good to hear Happy Taipei has them both and more. Staying here for 600 plus pesos per night is reasonable. I wonder if they offer unlimited coffee and tea? In Thailand, the hostel I stayed at for 400 pesos has unli coffee, tea and milk tea. But unlike ur bunk bed, no curtains. I’ve never stayedin a mixed dorm eith curtains before. It’s very useful especially when u still want to keep ur light on or in my case sleep with short shorts. I’m going to Taiwan in July. 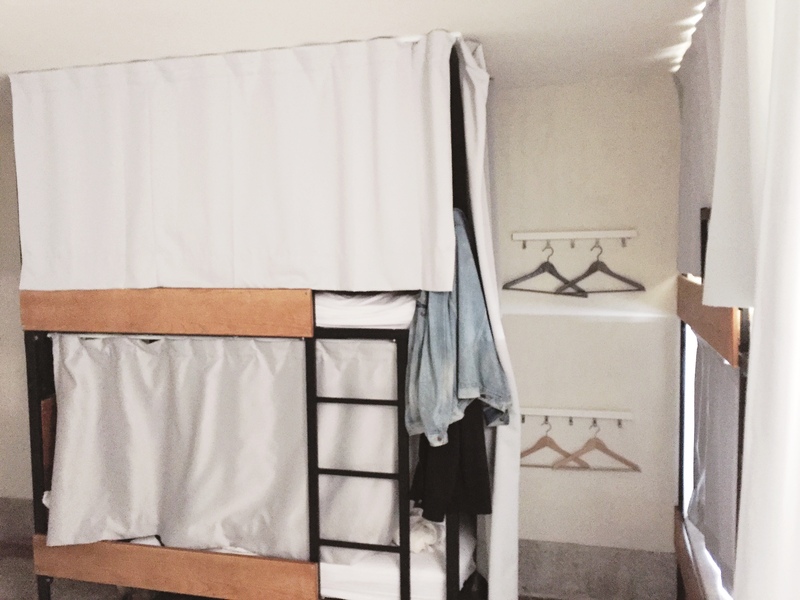 I wish to stay here and exp the curtained bunk beds but Id be staying with my relatives so I guess next time. The hostel is so vibrant and bright and you have provided detailed information about it and a step by step direction to reach it. I have never stayed in a hostel apart from the ones during college days, and do miss that spirit of bonhomie which prevails in these places. Shilin district is a little far from the airport. And the hostel is a little far too from the Shilin station. Anyway, I wouldn’t mind traveling a little far if it was me though, I gives opportunity to explore and see places. Nope, it’s not that far from the Shilin Station. The walk only takes 5 to 7 minutes. It seems that this hostel has everything I look for when I want to book a hostel. Cool that you explain how to reach it, navigating in “China” is always difficult without a little bit of Chinese. By the way, apart from the hotel do you also recommend to visit Taipei? Hi Elisa, of course I definitely recommend Taipei, it is such a beautiful city and Taiwan a lovely country. In fact I am already thinking about going back this year. I do remember that Convo. Hahahah. Anyway I see what you mean about that ladder. Tricky. I would have reserved a bottom bunk for me. I hate those kinds of ladders. Good that they have a privacy curtain but too bad on the bidet. And I was surprised about the wifi. I thought Taiwan had good internet! And it sure is an adventure to get there. They do have good Internet, at least in most areas area. I’m not sure why the signal is a bit weak in the hostel though. So for Internet, I highly recommend booking Klook, it is very reliable. I’ve only been to Taipei once for a short layover, but it would be great to experience more of Taipei and Taiwan in general in the future. 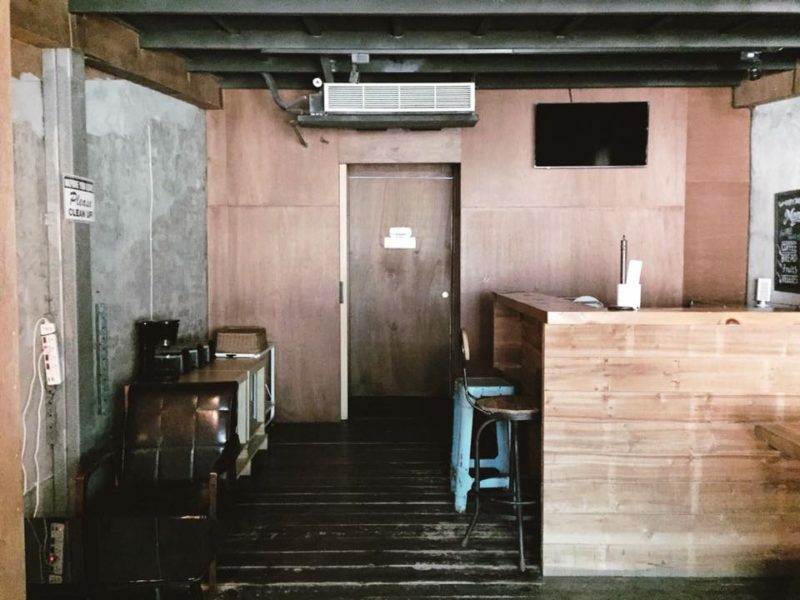 Did you find many budget friendly options?> I don’t know much about the area but it looks like there are a lot of things to do. Thanks for this guide! Hi Jessica. Yes, I find Taiwan relatively cheap, at least it is cheaper than Japan. The food is cheap and there are many cheap hostels. Great post. Never tried hostel option whenever traveled outside. But after going through your post I am getting a feel that I should try this option also which will be pocket friendly. And when I visit Taipei, I will definitely going to consider this option of stay. 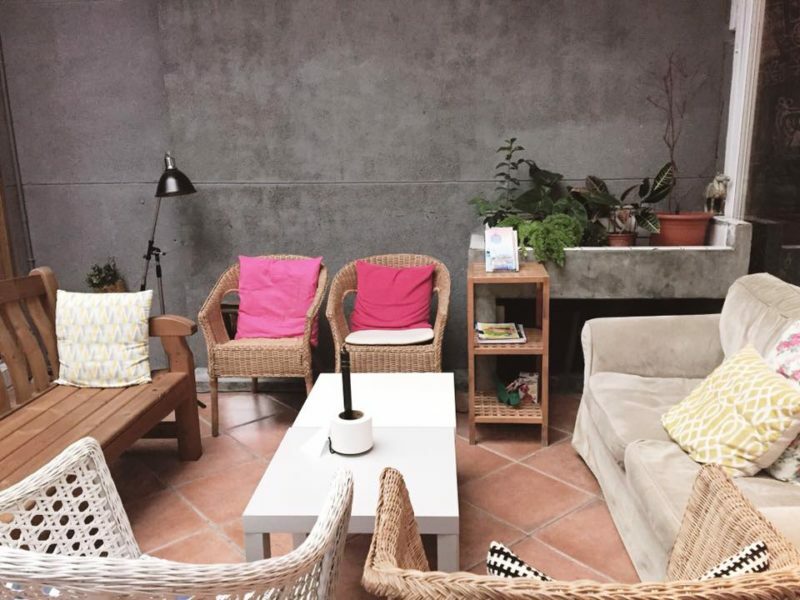 Staying in hostels is not that bad, especially if you find a good hostel. So far, in my case, I haven’t had a bad experience in any of the hostels that I stayed in. That’s quite an adventure! My husband went to Taipei also years ago. He shared about the places he visited. This made our entire family interested in visiting it someday with him. Did you get to visit Taipei 101? Hi Teresa, nope, I did see Taipei 101 from afar but I didn’t bother going inside. Actually, my friends call me Ms. Google already not because of the reason that you mentioned but because I happen to be working as a technical writer in our company under Google account. wow..what an amazing place that is and moreover would have been for you for you found it after getting lost…but at last did you interacted with the others or stayed back..
Taipei looks gorggggg! Love all your photos and would love to go here one day! Your friends advice about just randomly sitting next to someone is funny! Try it out, would be a great story I’m sure, or maybe an awkward story. Hahaha! I can’t do it hahahaha…. I have to have some bit of dignity hahaha…. Yeah, the towel is bulky indeed. I’m not sure why they don’t provide towels though. I hope you enjoy Taiwan as much as I did! Wow that must be a great travel experience to Taipei. I wanted to visit Taiwan too but not so soon. The hostel looks very basic for me but as long as it is safe and comfortable its okay. I just don’t feel like travelling and asking for directions when finding the hotel. I am poor in communicating and in using the map! I get irritated easily hahaha. And so i would prefer a hotel near the stations and where a cab can drop me right in front of it.. btw, i like the bunk beds with curtains. Looks cute! I’m sure it can be found by a taxi, but I didn’t want to take the cab because it’s expensive. Oh wow, what a brilliant ‘guide’ 🙂 I really enjoyed your post, as it almost feels like really walking with you through all these streets.Very smart done! I wouldn’t be too keen on that hostel tho, but hey … I understand that this is rather a place for young people traveling on a budget. Anyhow, your images are brilliant. You’re right. 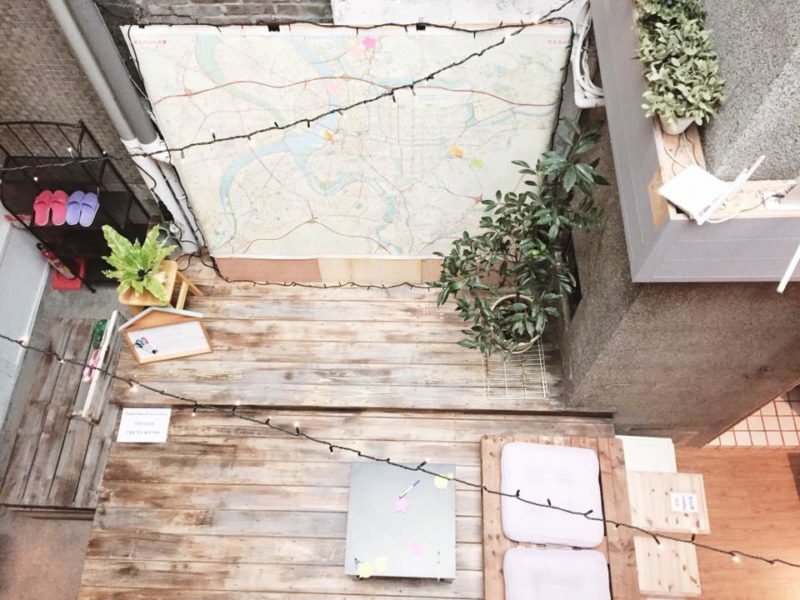 This hostel is really for the budget travelers. Such gorgeous pics, Marjorie. Sounds like a decent place to stay in Taipei. Love how you have provided such detailed directions to the hostel. I cant live without wiki and would be interested to hear back from you about Klook. Hey Revanthi, don’t worry, I am going to make a review of Klook. It is quite useful and reliable that I want people to know more about it. Folks don’t like to pack much especially when you know you staying in a hotel or hostel, but I think is hygiene bringing your towel along. Clearly described details with photos of how to get yourself from the airport to Shilin District. I was a bit disappointed too that they don’t offer towels, but I guess it’s okay when you’ve put it that way. It’s my first time hearing about Happy Taipei hostel. I agree with you that staying in the upper bunk bed is such a hassle. I hope the bed doesn’t creak so the one staying in the lower bunk bed won’t be disturbed. Anyway, I love how it offers privacy for a mixed dorm. I just find the common area too plain for my taste. 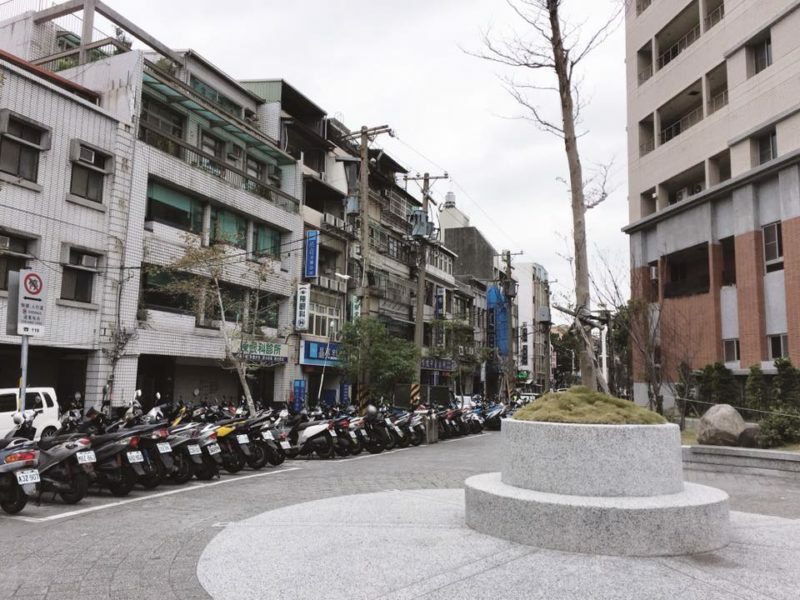 By the way, since that hostel is in Taipei Main station, you can also walk to Ximending which is also a pretty cool neighborhood. Hi Me-an, actually, this hostel is far from Taipei Main Station. This is in Shilin. Loved reading the detailed trip to the hostel 🙂 Free breakfast, hot water with these two luxury stay should be easy. Intermittent Wifi may bother me too. Noted your suggestion for Klook. Klook is super helpful and it’s cheap! Yes, in fact, my airfare is around 4,000 pesos, which is not bad at all!